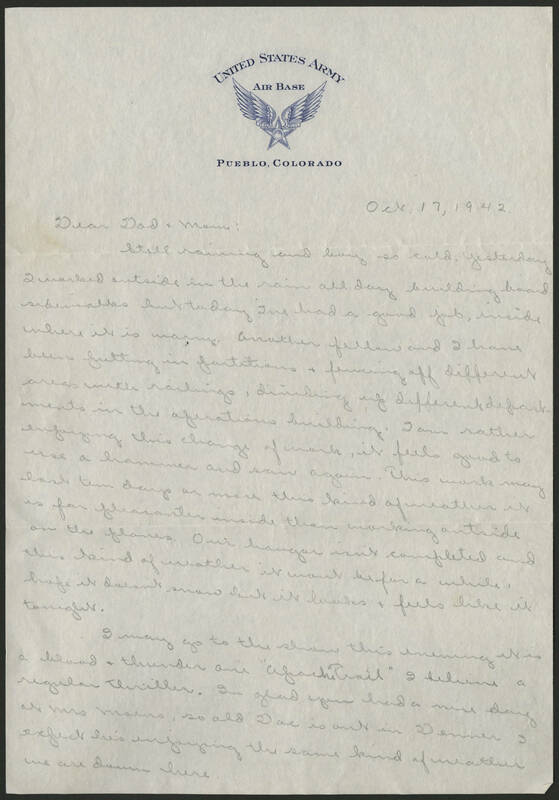 Oct. 17, 1942 Dear Dad & Mom: Still raining and boy so cold. Yesterday I worked outside in the rain all day building board sidewalks but today Ive had a good job, inside where it is warm. Another fellow and I have been putting in partitions and fencing off different areas with railings, dividing up different departments in the operations building. I am rather enjoying this change of work, it feels good to use a hammer and saw again. This work may last ten days or more this kind of weather is far pleasanter inside than working outside on the planes. Our hangar isn't completed and hope it doesn't snow but it looks & feels like it tonight. I may go to the show this evening it is a blood and thunder one "Ozark Trail" I believe a regular thriller. Im glad you had a nice day at Mrs [Maens? ], so old [Day?] is out in [Denner?] I expect he's enjoying the same kind of weather we are down here.